Recently some benevolent sponsors gave me a grant to purchase a DVR for myself. The notion was that I would "lease" a PVR from our local cable provider at their going rate of $10/mo, plus $30 for their digital cable service. In all honesty, I'm not that big of a TV watcher. However, there are two shows that I go absolutely giddy for... but I constantly and consistently forget that they're on. I actually have... prepare yourselves now... a monaural VHS video cassette recorder that I usually commission to record my show once a week. Yes... I actually have used magnetic tape up 'til now. Magnetic tape that has started to wear very, very thin. The DVR gift was a great idea. But where my benefactors might expect me to zig, I zagged. Every Linux zealot wants to build a Myth box. It's become nearly a rite of passage. Nowadays every IT department is brimming with architects who design and provision their own home theater PC to record an entire lifetime of "The Simpsons." Some use Windows Media Center Edition, some use SageTV, but those who have that extra oompah down their pants build a MythTV box. A lot of people don't realize this, but Linux distributions (and often BSD distributions for that matter) are filled to the brim with building blocks. The basic components for everything you could ever need are all right there. LDAP? Check. An HTTP server? Check. A framework for playback of any number of video codecs? Check. A way to quickly transcode video? Check. The problem with Linux software isn't that things don't exist... it's that there is no glial matter binding it all together. That's why projects such as QDVDAuthor, Kino and MythTV are so lovingly accepted and absolutely brilliant. They build on existing infrastructure such as MySQL, Xine, ffmpeg, mjpeg tools, lirc and the kernel itself to give the user a single, consistent and logical interface to it all. The Kino authors have written much of their infrastructure itself, but MythTV does a great job of leveraging the given strength of a platform and concentrating on an extremely usable and imminently extensible interface for the user. I was decided I'd build a MythTV box. The total cost needed to be cheap, the heat & noise needed to be minimal and the form factor had to fit in a narrow cabinent where my VCR resided. High-definition content wasn't (currently) the target... this was simply going to be a replacement for the aging tech that took five minutes to program each time and had to be manually rewound. I spec'd out two possible hardware platforms: a Mini-ITX setup that was largely integrated and had a very small footprint & power consumption, and a Micro-ATX setup that had some definite beef and a litany of possibile upgrades in the future. In the end, the Micro-ATX setup was nearly twice the cost, five to ten times the power consumption and required a larger footprint. While the Micro-ATX setup would have eventually granted me HD DVR capability in the very near term, all I wanted was lo-res basic cable. The VIA's EPIA CN is a nice all-in-one solution with MPEG2 acceleration, hardware crypto, TV-out, insanely low power requirements and passive cooling for everything - including the CPU. All I needed to add was a case (with included power supply), a Hauppauge PVR-150 for on-board MPEG2 encoding, and some RAM. I found an old 40 GB Western Digital hard drive lurking in my closet, so I blew the dust off and prepped it for service. No CD or DVD drive needed... again, this is just a surrogate VCR. Whenever I try to build a system, it seems at least on thing needs to be returned or RMA'd. Everything arrived quickly enough... so I began cracking open boxes. When I opened the Happauge box I was surprised to discover they had swapped out the PVR-150 with an HVR-1600. Evidentally Hauppauge has taken it upon themselves to replenish their PVR-150 stock with the more impressive, albeit completely incompatible, HVR-1600. It's a nice tuner, don't get me wrong. It has two on-board tuners: one for standard TV and one for terrestrial HDTV; however the HVR-1600 is completely unsupported in Linux, and doesn't look like it will be obtaining support any time soon. While I'm sure Hauppauge thought they were doing everyone a favor, they forgot that they had a huge following of Linux users. I contacted Hauppauge directly, and they swapped parts with me fairly quickly. 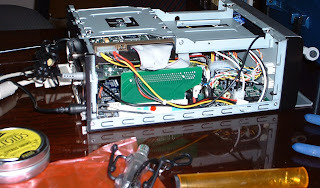 Once the PVR-150 came back, I prototyped the Myth system with my current workhorse workstation. I tossed the PCI card in to my AMD64 system, ensured I was able to receive a terrestrial television signal and confirmed the IR remote worked properly. Once I was satisified that the hardware was sound and Linux was up to the task I began constructing the box. Of course, whenever you work in a Mini-ITX case you leave yourself zero room or expansion. You'd better hope that any oblong hardware fits like a jigsaw puzzle, otherwise you're hosed. Wire management is key - the first few builds of the box evidently had some wire or component that was unsatisfactorily grounded. One snap of static electricity to the case would cause the entire machine to sieze up. Not good. 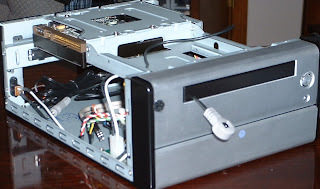 A hole was drilled through the plastic cover that would conceal the slot where a small CD/DVD drive would otherwise fit. 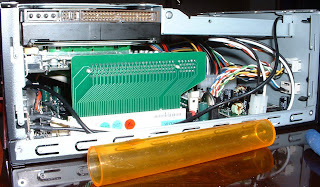 This would later allow me to route the IR receiver from the PVR-150's PCI slot, through the back of the case, past the innards of the box and out to the front bezel. 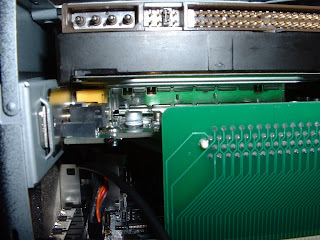 The hard drive and PCI card, once mounted, were a tight fit against each other. The hard drive actually ended up pressing against the metal shield surrounding Hauppauge's TV tuner. Not sure if this will cause problems... either due to the heat generated by the drive or the RF leakage that the tuner's shield is supposed to reduce. Luckily the case fan is not far away, so the exhausted air may at least provide some relief for the heat buildup. Wiring the front bezel to the motherboard's header pins is always fun. It took me nearly 20 minutes to distinguish the orientation and location of the power, reset, HD activity and power LED... but I eventually figured it out. The case emitted a blue light that completely pierced the retina - I yanked that cord fairly quickly. 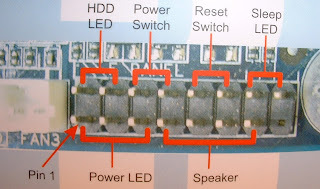 I also discovered by my own error-and-trial that connecting the front bezel's audio ports disabled the rear audio ports. One or the other - not both. I had to take the case back apart and re-jumper the header pins to allow audio to be piped out the back of the box. Finally after all the lacerations to my hand were mended and all stripped screws were replaced, I was ready to hook 'er up and see if I could get it to POST. Long at last, it did. I was fairly happy with the form factor. I had routed the IR cable through the case to the front, which helped astetics somewhat. The IR blaster cable was twist-tied in the back, and the IR receiver was adhered to the front with some 3M dual-sided sticky pull stuff they use for posters or coat hangers or whatever. With all said and done. I ended up with a case that was about 1/3rd the size of my original VCR. Not to shabby.